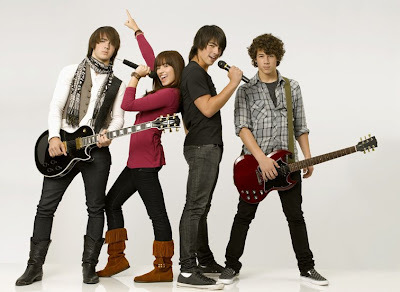 Disney Channel will begin production later this summer on Camp Rock 2 The Final Jam, the sequel to the hit Disney Channel Original Movie Camp Rock, with Demi Lovato, Kevin Jonas, Joe Jonas and Nick Jonas reprising their starring roles. Joining the cast are Matthew "Mdot" Finley and Chloe Bridges. Also returning to the sequel's cast are Meaghan Martin, Alyson Stoner, Anna Maria Perez de Tagle, Roshon Fegan, Daniel Fathers and Maria Canals-Barrera. Camp Rock 2 The Final Jam is scheduled to premiere in 2010 on Disney Channel. The sequel’s storyline follows Mitchie, Shane, Jason, Nate and their friends as they return to Camp Rock for another great summer of music and fun. However they soon learn that a new state-of-the-art music/performance camp, Camp Star, has opened across the lake and has lured away many of Camp Rock instructors and campers - putting the future of Camp Rock in jeopardy.And when Camp Star’s hotshot performer, Luke Williams, challenges Camp Rock to a musical showdown to see which camp really has the stronger musical talent, everyone prepares for the ultimate battle of the bands. Meanwhile, in a classic Romeo and Juliet twist, Nate falls for the daughter of the owner of the rival camp. The movie's soundtrack will feature a mix of pop, rock, R&B and hip-hop songs written by songwriters Mitch Allan, Adam Anders, Lyrica Anderson, Antonina Armato, Aris Aronchitis, Peer Astrom, Kara DioGuardi, Andy Dodd, Toby Gad, Nikki Hassman, Jamie Houston, Tim James, Jeannie Lurie, Chen Neeman, Kovasciar Nyvette, Steve Rushton, Dapo Torimiro and Adam Watts. Joining the cast are Matthew "Mdot" Finley as Luke Williams. Mdot is an accomplished R&B musician who has performed as the opening act for Ciara, Yung Joe, Dem Franchise Boyz, Lil' Romeo and Mos Def, and was named Best R&B Male at the Urban Threshold Music Awards in 2006. Chloe Bridges joins in the role of Dana Turner, daughter of the rival camp owner. Bridges is a noted classical pianist whose film and television credits include Forget Me Not, The Longshots and The Comeback. The executive producer is Alan Sacks (Welcome Back, Kotter, The Color of Friendship). The producer is Kevin Lafferty (Wizards of Waverly Place The Movie, Jump In! ).